A comprehensive guide and fact sheet about the Menes. Discover fascinating facts and information about ancient Egypt and Ancient Egyptian Menes. Was this person just a legendary figure? Click a link for additional information and interesting facts about subjects relating to the ancient Egyptian pharaohs and other aspects of daily life, the people and places of ancient Egypt. The figure of Menes is surrounded by mystery. Did an ancient king called Menes rule Egypt during the Early Dynastic Period of ancient Egypt? Was he simply a legendary hero? Or was his name confused with other early kings of Egypt? His name, his identity, his existence, are all uncertain. This article provides facts, information and ancient references to the ancient Egyptian ruler referred to as Menes. Menes has been described as the founder of the first dynasty of Egyptian Kings, credited with the unification of ancient Egypt, the founder of Memphis and the first law-giver. 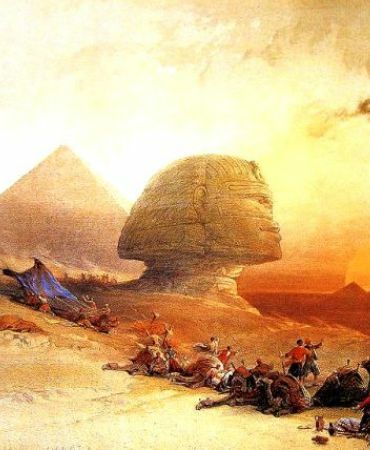 He is also credited with establishing ancient Egyptian religious practises such as sacrifices. The discovery of the Narmer Palette makes it very clear that the ruler named as King Narmer was the founder of the 1st Dynasty and the king who unified Upper and Lower Egypt, but Manetho credits this to a ruler named Menes. There is also a connection between King Scorpion, who was possibly the father of Menes, or once again, even the same person. Menes is one of the ancient Egyptian kings who appears to bear the name Scorpion. Some sources say he was the son of Narmer while others say he was Narmer. King Narmer was succeeded by his son, King Hor-Aha. The name 'Men' appears as one of the royal names of Hor-Aha leading to speculation that Menes and Hor-Aha are one and the same person. The names of King Scorpion, Narmer and Hor-Aha all add to the confusion as these names have all been linked in various ways to a ruler referred to as Menes. For the Early Dynastic Period, the archaeological record refers to the pharaohs by their Horus-names,associated with the god Horus, but alternative royal titulary was also used which gave rise to confusion. The Horus name was usually written in a serekh, the name of the king being written in hieroglyphs inside a representation of a palace. The serekh was the earliest convention used to set apart the royal name in ancient Egyptian iconography, before the cartouche was used. The problem with establishing the true identity of Menes is that the history of ancient Egypt dates back many thousands of years. The dates given for the 1st Dynasty, with which Menes is associated, are c3100 - 2770 B.C. The ancient Egyptian form of writing using hieroglyphics had not been not fully developed. For example, the early names of kings were identified using the serekh. The serekh was the earliest convention that was used to set apart the royal name in ancient Egyptian iconography, before the cartouche was ever used. Records, artefacts and monuments from the so long ago are incredibly rare. So much of our information about the early kings of Egypt comes from the writings of ancient historians who lived long after the deaths of these rulers. Additional listings of kings were recently been found in two necropolis sealings in the tombs of Den and Qa'a in Abydos. The sealings show Narmer as the founder of the First Dynasty, who was then followed by Hor-Aha. "In succession to the Spirits of the Dead and the Demigods, the Egyptians reckon the First Dynasty to consist of eight kings. Among these was Menes, whose rule in Egypt was illustrious." According to Manetho, the ruler Menes was the first king of a united Egypt, in which he as the king of Upper Egypt conquered Lower Egypt, that reigned for about 60 years during which time he led military campaigns to neighboring countries and that he founded the city of Memphis. Manetho claims that Menes was eventually carried off by a hippopotamus. The Greek historian Herodotus (c. 484 – 425 BC) refers to the first king of a unified Egypt by the name of 'Min', and claims that he was responsible for the draining of the plain of Memphis and founding the Egyptian capital there. "When this Min, who first became king, had made into dry land the part which was dammed off, on the one hand, I say, he founded in it that city which is now called Memphis..."
The Roman-Jewish historian Josephus Flavius (c. 37 – c100AD) refers to the first king of a unified Egypt by the name of 'Min', and claims that he was responsible for the draining of the plain of Memphis and founding the Egyptian capital there. "...the kings of Egypt from Menes, who built Memphis..."
Diodorus Siculus says that Menes was the first law-giver and that he established basic religious practises in ancient Egypt. The Turin King list, also known as the Turin Royal Canon, is a papyrus written during the reign of Ramses II in the 19th dynasty.
" Menes, may he live, prosper and be healthy..."
The Abydos King list, also known as the Abydos Table, is a list of the names of 76 kings of Ancient Egypt, found on a wall of the Temple of Seti I at Abydos. The name 'Meni' is listed as the throne name, and the Horus name is listed as Aha. Learning about the ancient Egyptians and Menes inspires everyone to visit historical sites and undertake Egypt Travel and Tours to experience the wonders of this magical land at first hand. Many people choose to experience a tour of Egypt on a Nile Cruise stopping at the famous destinations and sites of Egypt such as the Pyramids of Giza and the Great Sphinx. The information and facts about Menes will provide you with a great insight into Egypt and the legacy of the ancient Egyptians.